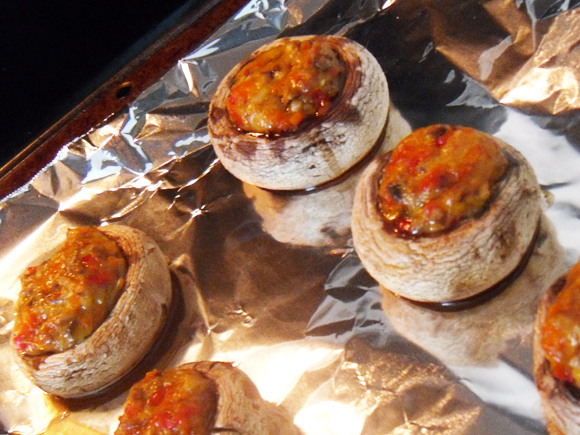 I love stuffed mushrooms but don't have them very often. They just seem like the type of food that you should only have as an appetizer for a party, so they don't really make it onto the everyday menu. And yes, I know I'm posting these just in time for those New Year's Eve gatherings, but they would also be great as a side dish at any dinner. I've omitted breadcrumbs in this version to cut down on the 'fill-you-up' factor and so it can be used in more ways than just a starter. They're, of course, great as an appetizer or a pass around at a party, but why save these scrumptious little bites for a special occasion if you don't have to! 3. Saute onion, carrot and salt in butter for about 5 minutes over medium heat, stirring occasionally. 4. Add red pepper and cook for about another 3 minutes or until soft. 5. Add garlic and chopped mushroom stems. 6. Cook over medium-low heat until mushrooms have cooked down and wilted slightly. 7. Turn off heat and add cheese. Mix well until melted. 8. Place mushroom caps onto lightly greased baking sheet, hole side up. 8. Fill caps with about 1 tsp cheese mixture, using a little more for bigger caps and a little less for smaller caps when necessary. 9. Bake for 10 – 12 minutes or until cheese is melted through and bubbly. * If you don't have enough, chop an extra mushroom or two.